The F.I.T. 80 is the fitness skater who wants to experience the speed of an aluminum framed skate. With an 80mm wheel size and standard cuff height, it makes for a supportive fit for any level of inline skater. 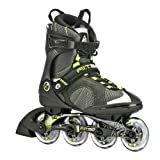 Beginner or entry-level inline skaters will enjoy the stabilty and controlled speed.